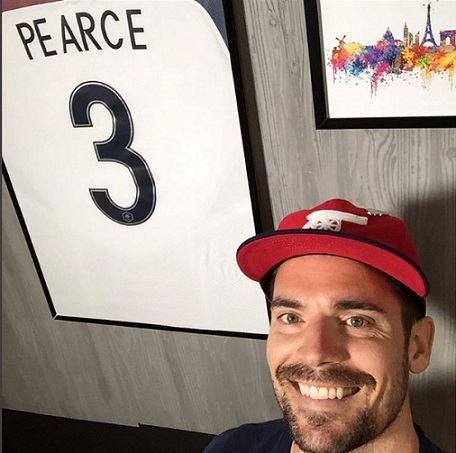 Excelling enough during his career to earn 35 caps for the United States and three Major League Soccer All-Star selections, Heath Pearce also had more than a dose of versatility in his locker, whether in the backline or the DJ booth. The Californian may have strayed further from the penalty area these days, but as the man with more interests than most, post-playing life was never likely to leave him boxed in. Together with a part in six MLS seasons, Heath crafted his own route in the European game, spending years in Denmark, Germany and lastly, Sweden, with IFK Göteborg in 2015. With no physical concerns and age not all that huge a factor for a player who only turned 32 this August, the former New York Red Bulls defender opted to take his knowledge and personality to KICK, taking over from former U.S. defender and teammate Jimmy Conrad as the creative lead and YouTube channel’s presenter. With a multi-faceted character that went with him throughout his playing career, Heath wanted to ensure he wasn’t limited in his capabilities beyond the field, and he explains how he ultimately came to the decision to switch stations. “I’ve always had a ton of interests, I never wanted to be seen as a guy who just knew soccer or someone who was invited to a party and just ended up talking about the game. I wanted to know that there’s a whole bunch of other things you can accomplish in your life. “I always knew this was a world I wanted to step into and the timing kind of matched up and I pitted that against the offers that I had to keep playing. I was like, ‘this has gotten to a point where this is a pure business decision now. “I would love to keep playing, my body’s fit, I’m healthy and enjoying it, but at the same time, I’m gonna wake up one day and just be done.’ Looking at it from a business standpoint, I asked ‘is continuing to play going to increase my résumé? “Is it going to give me a significant financial bump?’ Just kind of checking all those boxes against the chance to start a brand-new career with a smooth transition, with potential longevity, and that’s where it all kind of came to. 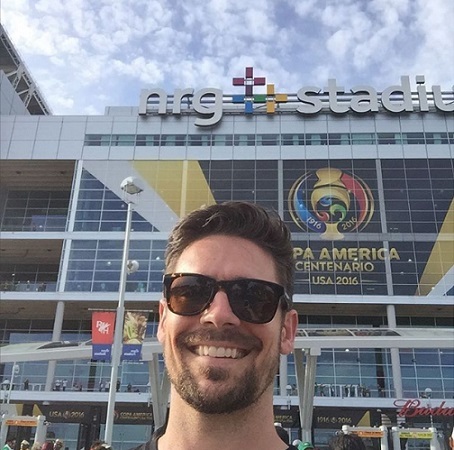 An MLS Cup runner-up with FC Dallas in 2010, Heath has been learning more of the finer details of colour commentary, with the ability to provide credible in-game or highlight analysis an attribute he wants to offer. As a left-back adept at going both ways, a central defender and even a right-back option, he also stepped into many roles away from the field, making life that bit less mundane wherever possible. One thing that has always gifted new kinds of energy and feeling to his life is music, and as well as bringing the hype on game day, it also helped see him and his teammates through the less buoyant times between the action. “Throughout my career, the one thing was that you could never really go anywhere. You’d get like a week or two off in a year, but you always had a large portion of time, so I’d try to dedicate myself to different languages or learning new hobbies. “That was everything from learning card tricks, magic tricks, to music. In my career, I’d been into drums, guitar, the classical-guitar-style finger-picking, and then piano. “In Germany, I had a room with different instruments and stuff and I’d just go mess around. I kind of landed finally with ukulele, which I got into through Kyle Beckerman with the National Team because guys used to travel with big old guitars and then he decided to try ukulele and it became this hobby that travels much easier. “I’ve been playing that over the last few years and I sometimes get together with my sister who sings. I have a younger brother who’s also a singer and has put out a couple of albums and is still pursuing his music career, so we get the whole family together, with my older brother who plays everything from banjos to guitar. 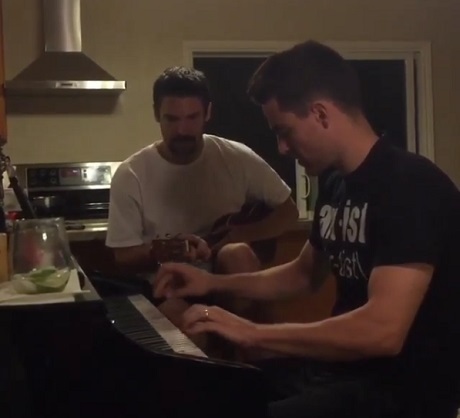 A jam session for Heath and fellow Modesto native, recording artist Conn Raney. Once upon a time in a San Luis Obispo record store, you could find a young Heath at the counter with some DJ Skribble and Crystal Method LPs. Along with a spell back home in The Golden State with Chivas USA, the Modesto native took his locker-room DJ shows on the road through the years. Far from just hooking up his phone and letting the playlist fly, he also jumped on the wheels of steel in his spare time. Heath’s younger sister, the actress and singer Lindsay Pearce, was one of the runners-up on the reality TV series The Glee Project, ultimately appearing on the Glee series itself. In one way or another, Heath has never had too far to go to hear a harmony or the strike of a beat. “I used to DJ quite a bit for six or seven years and I played some nightclubs, some parties, events, lounges, kind of hangouts, barbecues and things like that. I kind of got used to that and not having music at home unless I was working on a new set or new skills. “I play on two different types of equipment: the CDJs – which is more your house music – or the old-school Technic turntables, which I try to do as much as possible when I’m playing any sort of open format or trying to learn something with hip-hop. Music’s always been a part of me, I’ve got a huge appreciation for it and I try to contribute my musical taste to our (KICK) office environment now. “I kind of have a wide range I casually consume; like right now I’m really into Popcaan, which is reggae/dancehall. I just really like his kind of vibes, his flow, the stories that he tells through his music are really cool. Earning All-WCC honours playing at the University of Portland, Heath had been a U.S. international at Under-17, 18 and 20 level before making his senior debut as a 21-year-old in a November 2005 friendly with Scotland. Named in the 30-man preliminary squad for the 2010 FIFA World Cup, he was selected for the 2007 Copa América, as well as the Confederations Cup and CONCACAF Gold Cup tournaments in 2009, each under Bob Bradley. He remembers some of the playing personalities who had that feeling for finding a track, or even a verse of their own. “Kyle Beckerman was a guy who was very in tune with music all the time. Clint Dempsey and Eddie Johnson used to freestyle on the bus or in the car when we were with youth national teams. “There was a New York / New Jersey DJ that Tim Howard knew who would play these mashups and it worked perfect for our locker room because there were guys who liked the classic rock, and he’d do that over a hip-hop beat, or vice versa. Amongst the caps Heath earned for his country, he figured most often as the main left-back option in 2008, playing 11 times for Bob Bradley. Debuting during Bruce Arena’s tenure, he featured most recently under current coach Jurgen Klinsmann in 2012. Although there’s no shortage of current National Teamers with an ear for music, the team has a connoisseur in equipment manager Jesse Bignami. He has earned several mentions on this site over the years for his unofficial job as the team’s pace-setter and Heath takes us behind the scenes into what the players would walk into on game-day arrival. Unlike so many MLS players today, Heath’s passage into the pros didn’t come via the league’s SuperDraft. Prior to his full international debut, he had ventured to Denmark part-way through the 2004/05 Superliga campaign to join FC Nordsjælland, where he would score twice in 75 league games and feel distinctly at ease on a new continent. “Denmark was great because everybody spoke English and I got games right when I got there, and during two and a half years I only missed two or three league games when I was available. After games you’d put on music and have some fun; that was more like Danish folk music and part of the history and culture. “I used to host guys over on Sunday nights because we’d watch the late Spanish league games and after that we’d go out for a drink or go out and have fun, whether it’s a billiard house or something. A lot of places in Europe there’s not a lot open on Sundays, but we’d get together at my place, we’d play pool, we’d hang out, we’d watch TV, play video games and we had that real dynamic. At Nordsjælland, who became league champions in 2012, Heath was part of a side that improved year on year, finishing 10th, 9th and 5th during his stay. Based with the club in the North Zealand town of Farum, he was shown around by Mads Junker, a Danish striker who was among the Superliga’s top scorers in Heath’s first two seasons before a move to Dutch club Vitesse Arnhem. Former Celtic and Denmark midfielder Morten Wieghorst became Heath’s coach ahead of his final season at the club, moving up from assistant and introducing him to new ways of pushing himself in each training session by setting personal challenges. After thriving under Wieghorst’s guidance, a 2007 switch to Hansa Rostock brought a relentlessly intense level of team training and an especially serious environment, with life in the former East Germany altogether more testing. German defender Benjamin Lense was the fluent English speaker in the team and somebody Heath felt the most familiarity with at a time when the infectious team spirit he had been accustomed to wasn’t truly there. In the first of his two seasons, the club was relegated to the second tier and struggled to mount a promotion bid in the 2.Bundesliga. Despite a move to Turkish club Bursaspor being agreed, the deal fell through, leading Heath to MLS for the first time in September 2009 with FC Dallas. With the Texans in 2010, he came up with six assists as FCD beat Real Salt Lake and LA Galaxy to reach the championship showdown with Colorado Rapids. Schellas Hyndman’s team lost out in extra-time of that game, but Heath’s time with the club was one in which he felt very much on the same page as those around him, or rather a guest at the same party. “In Dallas, we all lived out in the suburbs. We had a really unique team that year and we were always together. “I had built a house when I got there, so every couple days we’d have a huge group over, swimming or playing shuffleboard. By the end of the season, when we’d gone on these streaks and set records on the way to the final, it was like a party in the locker room every single time; Latin music, dance circles, guys going crazy. During his college years, Heath had played for Bradenton Academics in Florida, where he also spent time living with a Venezuelan family. With so long spent far from home, he finally got the chance to take his career back to California as he joined Chivas from Dallas in early 2011. Being able to see family regularly and have them at his games was huge, and as well as soccer, Cali was also of course where his music love first caught fire, with more than a few from the West Coast taking up his early listening. “E-40 was a huge one – my parents must be so disappointed now knowing we were listening to explicit music when we were explicitly told not to! Too $hort, I was into 2Pac for a really long time, Sublime was another big style I was into. “Everclear when I was living up in the Pacific Northwest, also another style I was really into. Just a wide range, but for California specifically, those are the main guys, even though I’ve kind of been a Biggie guy for a while now. “The first one that I remember buying was the Dangerous Minds soundtrack. This was during a time that I was skateboarding and things like that. “I used to get kind of picked on by other kids I skated with because at the time if you were a skateboarder you listened to alternative music, your Green Days and whatnot, or you were into kind of like ska with a lot of horns and standing-bass-type things. I started getting into the hip-hop world with acts like A Tribe Called Quest. Heath played soccer at Peter Johansen High School in Modesto and would like to use his experience in the game to help develop talent in the Central Valley in the future. He has carried the name of his hometown with him throughout his career and he explains how Modesto is decidedly different from the images so much of the outside world has of his home state. “I mean Modesto is kind of the forgotten place of California, to be honest. It’s probably one of the few affordable places in California but it’s surrounded by ag land, ranches, dairies. “It’s changed a lot over the years, the demographic has changed. It’s always been a very low median household income, but very diverse in its soccer knowledge. A high school kicker, Heath was a coveted football prospect and has a brother who earned All-American recognition in college. It was fútbol instead that Heath would dedicate his focus to, and as his potential continued to build at UP, he was also the chief creator at large behind the scenes for the Pilots. “I used to make our game day mixtapes and I would always do the kind of starting 11 announcement; rhyming things about players, inside jokes, the way they played, kind of teasing everyone and lightening the mood. I would do that during the week and play it on our game days in the locker room and guys would kind of jump out and dance and do fun things about it. 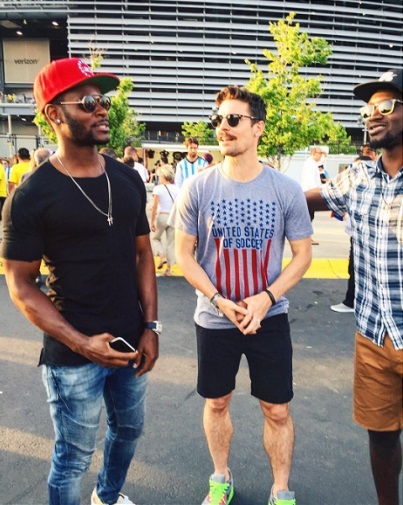 Heath alongside former U.S. teammates Maurice Edu (left) and CJ Sapong (right). For as much appreciation as he has for wordplay and rhyme styles, when it comes to the unique dynamic of a live performance, Heath’s ultimate show to date was actually pretty far from that hip-hop vibe. “The best live show I’ve seen – and this is one who’d be high on my list if I had to listen to someone outside of Queen – would be Hall & Oates. Their live show is incredible and they’re kind of timeless. “What I listen to and consume in terms of beats and the rhythm doesn’t always sound great live – live is a whole other emotion and experience – but Hall & Oates was incredible. I would have loved to have seen Michael Jackson in his prime; I used to watch video tapes of him when I was younger and try to do the dances. Back in 2012, legendary Colombia striker Juan Pablo Ángel talked on here about the mix of Latin rhythms and hip-hop flows dominating the Chivas locker room at the time. Heath had often been the Rojiblancos’ mixmaster, although when he switched coasts to join New York Red Bulls, he had some pretty respectable opposition in the form of his new Norwegian international teammate. “We had another DJ in the team, Jan Gunnar Solli, who I did some stuff with on a professional level on the side. He had really good taste in music; he was the kind of guy who wouldn’t get all the credit for finding that music months before everybody else because that was his life. Together with former Rosenborg full-back/midfielder Solli, Heath performed a DJ set at the FIFA ‘13 launch at New York entertainment venue Spin, meeting Snoop Dogg in the process. One player who has adorned the game’s cover in years gone by is Arsenal icon Thierry Henry, who undoubtedly took the Red Bulls to a new profile when he signed in July 2010 after three seasons at Barcelona. The World Cup winner was with New York up until retirement in 2014 and Heath remembers the Frenchman’s all-round impact, along with what he had to give when the sounds were swinging. “Thierry was very much into the hip-hop side of things and if you got French rap or West Indies music on in the locker room with him and Péguy Luyindula they would definitely join in and get down. Typically, Thierry knew his music really well; hip-hop, r&b, a little bit of house music, top 40 kind of stuff. “He was great to work with. I’d say until Tim Cahill arrived, myself and Dax McCarty, and obviously Rafa Marquez, were probably his closest friends outside of that ‘celebrity footballer’ group. “He used to have us over, we’d watch basketball, we’d watch Champions League at his place, occasionally when we had a weekend off we’d go grab brunch, Thierry, Dax, myself and sometimes a couple others. He was really approachable, and while he was approachable he was extremely volatile on the pitch! “He demanded the most sometimes out of guys who didn’t know how to give more, didn’t necessarily know that they could give more. Going from Barcelona to the New York Red Bulls can be quite eye-opening; while you still have a lot of quality at the Red Bulls, like playing a possession game it’s hard sometimes to get the passes you would the whole time at Barcelona, where it’s magic. Heath came up with two goals in the 2012 season – also the year in which he deceived D.C. United’s Danny Cruz with some noteworthy left-back skill – and was with New York in 2013, though he had to watch on as the team secured the Supporters’ Shield under Mike Petke. A hip labrum tear just before Heath’s trade to Chivas in 2011 had been something he managed for a while but he would need treatment and individual work before and after training, which eventually became as long as an hour before and after. Where he would usually have been all-action in duels and using his pace to rush in and eliminate danger, he had been shackled in that sense, and so he opted for surgery in the closing months of the 2013 campaign. That would ultimately be the conclusion of his Red Bulls chapter, with a final MLS season in 2014 spent in the blue of Montreal Impact. An MLS All-Star selection in 2010 and 2011 while with Dallas and Chivas respectively, Heath had been named for the third consecutive time while at New York in 2012, but had to withdraw ahead of the game with Chelsea at PPL Park due to a hamstring injury. He had, however, toured with an all-star collective of his own on many occasions by then. “With the National Team, we had an imaginary band that we called Tres Palms. Everywhere we used to go and travel, the group of us would be: myself, Danny Califf, Steve Cherundolo, Tim Howard, Carlos Bocanegra and Jay DeMerit. “It was named after like a beach in San Diego that Steve Cherundolo had come up with. We had hats made and things like that, and oddly enough, this is when the Rock Band video games came out, so when we were in lockdown in hotels we always had that leisure room set up. In December 2014, Orlando City selected Heath as the 13th overall pick in the Expansion Draft ahead of their debut year in MLS, but it wasn’t until January 4th that he received an offer from the club. At the end of the month, he chose to take on a new challenge again in Europe, with the strong sense of unfinished business. The desire for the pressure that comes with stepping out for a winning team fuelled Heath all the more as he signed with 18-time Swedish champions and two-time UEFA Cup winners IFK Göteborg. He talked of his move to Gothenburg as something to help put him back in National Team contention, and although his plans took a different course later that year, the times he suited up for the States are safe in the memory. He recalls the anticipation and jangling nerves he felt on the sideline at Hampden as he prepared to replace DaMarcus Beasley for his debut against Scotland and there are other moments lodged in his memory with similarly vivid quality. The first of those that came to mind was one from the U.S. v Mexico scrapbook, a rival match that has been played 25 times since 2000, with the Americans winning eight of those 2-0 (hence U.S. fans’ ‘Dos a Cero’ nickname for the fixture). Heath flips open the album to February 2009 when Michael Bradley netted both goals in a World Cup qualifier in front of 23,776 at the relatively compact Columbus Crew Stadium. “It was such a crazy kind of build-up to the game, the weather was insane and the rain was like flying horizontally. Just that atmosphere; it was one of those games where as soon as it kicked off and you went into a challenge you could feel ‘this guy’s behind you, that guy’s behind you’ and it felt like we had 20 guys on the field. “It’s one of those rare games where I can replay the entire 90 minutes in my head instead of still images or little clips you usually get. That one and beating Spain in the (2009) Confederations Cup, where technically we were supposed to be out of the tournament; we lost to Italy, we lost to Brazil and ended up going through on goal difference by beating Egypt. You can find the 2016 Heath still bringing that same scintillating enthusiasm to the game, even if the office is now the training field! KICK is of course not the typical place to work, and for Heath, he has been able to transition to a time after playing in which he gets to take a new vantage point within the stadium that is the beautiful game. “It’s a great environment. The whole idea is that we’re trying to capture the voice of the American game. “We want to be everything that happens outside those 90 minutes. We don’t have game rights, we don’t do linear television, but we want to be the place where you go as soon as those games are over, or before those games or at half-time. “We’re a mix of storytelling, documentary-style, and then your daily news and information. It’s a mix of travelling, on location, to kind of sharing our thoughts here using New York City as our backdrop, being at the tent pole events around not just North America but the world. From music to fashion, the wheels of other interests have never stopped spinning for Heath and have certainly made for a life lived so far in razor-sharp colour. While he was coaching him at New York, Mike Petke once told Esquire how Heath wasn’t afraid to push the boundaries. Granted, it was his outfits and sense of style he was talking about, but it applies pretty well considering the path he has taken. Given the gift to go back and offer any advice to the Heath who was just starting out in the game, or trying to find his way at the top level perhaps, what would he have to say? “I mean that’s a tough one, right? Looking back, a few times I did turn down more money to make the right decisions in my career, so part of me goes, ‘Hey man, just go get the money and enjoy it!’ you know? “On a more serious note, I would tell myself to just trust in the process more, trust in the people more and trust in the fact that you’re on this journey and there is no straight-line path or ‘right’ way to get to where you want to go. Everybody’s gonna get there differently and whether you take a step left or a step right, just trust in that process a little more and have faith that if you don’t play a game it’s not the end of the world, you can play next time. As he continues to establish and share his post-playing style, vision and voice, ‘Hollywood Heath’ has this year become a father, as he and his wife Laura welcomed their daughter Alessandra Sierra Pearce in July. He is one of the emphatic examples of how what you do on the field is never the complete definition or limit of who you are, and the way is clear for much more of that in his new ventures. He may not have started his career in MLS but he was proud to have represented the league and to have shared the stage with some masters, as well as when it came to international play. In his response to the closing question, he drew upon both. Each player on the site in the past few years has been presented with the fantasy small-sided game scenario to finish, with the idea that they are in a team of five and given their pick of any teammates from their career to join their lineup. It is completely down to them how they approach it, whether they opt for players on ability alone, personal connection, great memories, or even just for the entertainment factor. There are over 400 international caps in Heath’s team, so between the five of them they may just have the know-how to pull together a result or two now and again. “In goal, I’d definitely have Tim Howard. He was my roommate for a long time and he taught me quite a bit. “We don’t keep in touch as much now but still a guy I learned a ton from and a great, great player on the field. Great reaction stopper and in small-sided you’ve gotta have somebody who can be brave and be big and make those close-range saves. “Then next…I wouldn’t even know where to put myself. I’m definitely putting Thierry Henry up top, and then behind him I’d probably put David Ferreira because he’s that guy who’s just so good on the ball and so dangerous. “That’s what you want from a number 10, because there’s not that many of them left and he could just light up a game in any moment. For my other midfielder, I’m taking Michael Bradley.